The $80, seven-course tasting menu at this weekends-only restaurant is not as remarkable as it should be for the price. During the week, chef Jeffrey Kessenich prepares meals for the Kois Center, a dental teaching facility on the south shore of Lake Union. Seminar attendees eat buffet style and the health-conscious menu is centered on vegetables, whole grains and lean proteins. 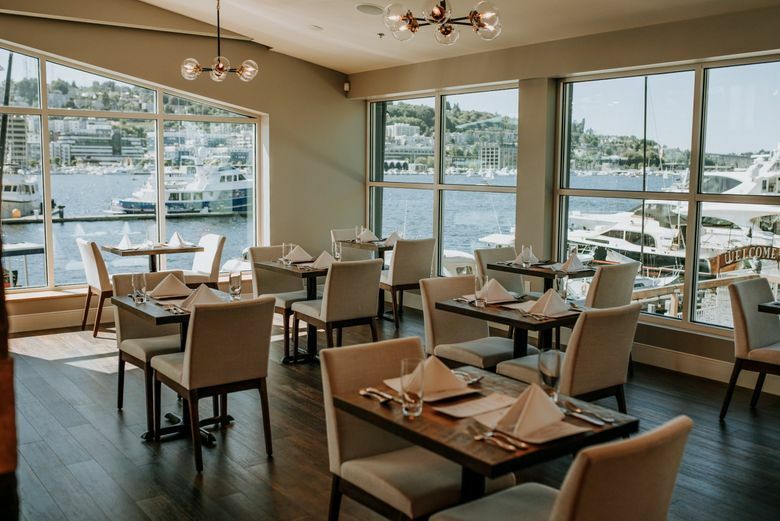 But on Friday and Saturday nights, the Kois dining room becomes Birch, a full-service restaurant, open to the public, offering a seven-course tasting menu for $80 per person. Birch opened this past summer, prime season for enjoying the skyline-and-water view from its second-story perch. This time of year, twinkling, shimmering lights fill the darkness beyond its two walls of northwest-facing windows. Inside, wood-paneled walls, a central fireplace with a stone chimney and tabletops made of reclaimed barnwood evoke relaxed formality. But wine glasses wobble on the table’s uneven terrain and at one point a small vase of red rose buds toppled over. No damage done, but it seems a metaphor for Birch, a restaurant with some rough spots to smooth. The table’s rugged planks also disrupted the regimental lineup of forks, knives and spoons needed for so many courses — perhaps too many. The tasting menu is a staid procession of pretty plates, portioned in miniature, with sauces dotted, dribbled and slashed. The cooking is precise, the ingredients top-notch; but when it comes to flavor Kessenich colors inside the lines. When strident spices do turn up, their volume is often muted, less often too loud. 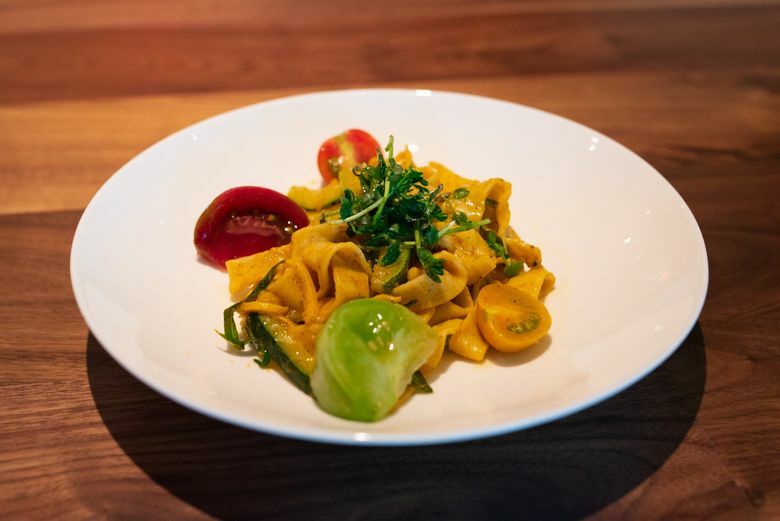 Dinner at Birch is by no means unpleasant; it’s just not remarkable, and for the price — around $100 per person, after tax and automatic 15 percent gratuity, and before beverages — it should be. The menu changes every four to eight weeks and can be modified for pescatarians and vegetarians. (The vegetarian roster is short on protein and in my experience relied a little too heavily on mushrooms, though they were matsutake.) Dinner begins with an amuse-bouche, then moves on to soup, pasta, meat and/or fish courses, and finally dessert, where you have a choice between a cheese plate of mouse-size morsels or a wedge of chocolate hazelnut tart that is wonderful but sliced so narrowly it appears to be propped up between a tuile cookie and a scoop of vanilla ice cream. Diners aren’t told in advance what’s on the menu, but you’ll leave with a printed copy of it that also lists the wine pairings, whether you opted for them or not. Pairings are an additional $50 per person for the equivalent of 14 ounces of wines (about half a bottle). Beverage director Zach Olson, a longtime sommelier at Daniel’s Broiler, does an excellent job of matchmaking. He can also guide you to individual bottles or by-the-glass choices that may be more economical. December’s standard and pescatarian menu begins with a strong opening act: a single shigoku oyster, panko-breaded and crisply fried, with a dab of lemon aioli and a lively green apple and kale slaw. (Vegetarians get an heirloom lettuce salad with apple and goat cheese.) Beet and parsnip soup with cabbage garnish and a minted yogurt drizzle follows. The soup is under-seasoned — borscht minus the braggadocio — and not nearly as compelling as November’s curried pumpkin soup. Next up is pasta, made in house. Tagliatelle and teensy nubbins of ricotta gnocchi were exceptionally well-wrought, ravioli less so. The sauce was rich with butter and whispered of sage, but they were too firm around the edges, and the exceedingly sweet squash filling was overwhelmed by cinnamon, nutmeg and clove. A highlight of November’s menu was a vibrant carrot risotto. Its partner was a tiny saddle of rabbit stuffed with greens and wrapped in Serrano ham (or mushrooms for vegetarians). This month, a lackluster leek risotto is topped with rabbit confit that was not as meltingly soft as it might have been. Pescatarians get a better deal: a duo of nicely crusted weathervane scallops flank their leek risotto. Pescatarians also get a double helping of king salmon. 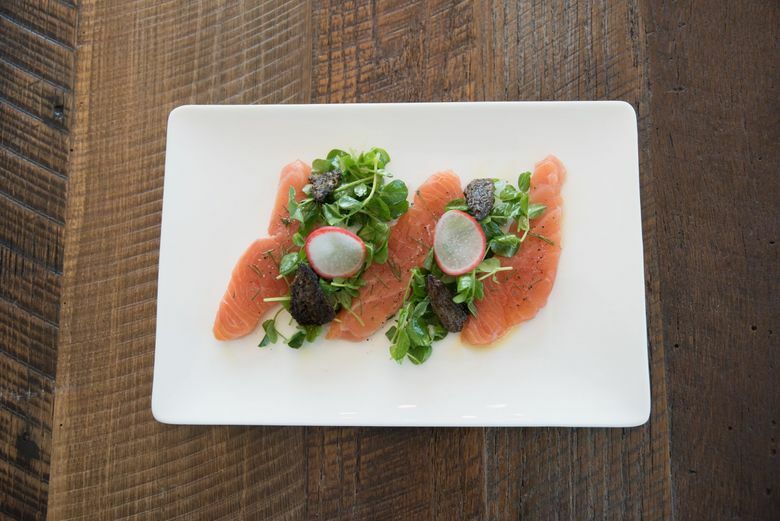 Dill-cured salmon gravlax with pea shoots and slivers of nutty-tasting Washington truffles make a lovely ensemble if you ignore the harsh, distracting side note of paprika oil. Roasted turnips, Brussels sprouts and potatoes support a crisp-skinned king salmon fillet. The menu describes the salmon as “spiced,” though I would be hard put to say with what. On the standard menu, those roasted vegetables are joined by a medium-rare medallion of Hawaiian venison loin sauced with cranberry-tinged jus. The venison replaced November’s pot-roasty beef short ribs served with celery root and parsnip purée that soaked up its tomato-rich, barbecue-like sauce. Even those heartier plates are on the petite side. You can always request more bread if you’re still feeling peckish. Kessenich’s soft, glossy yeast rolls are baked just before service and plated with a rosette of Wisconsin Amish butter sprinkled with flakes of Murray River sea salt. Kessenich, 32, grew up in Wisconsin fascinated by the birch trees that manage to look beautiful in every season. They inspired this restaurant and its seasonal focus. The pricey tasting menu didn’t send me, but the view is dazzling, and service is crisp and cordial from the moment they take your coat at the door, to the moment they help you slip it back on. How much is that worth to you?